The final winter is coming. 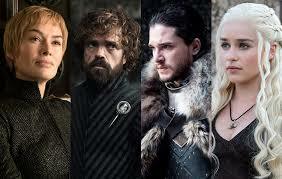 In only a few short months, epic fantasy series ‘Game of Thrones’ will come to an end and we will be left wondering what to do without Jon, Daenerys, the White Walkers, the shocks and the romps. One thing so many of us can’t help doing is imagining we ourselves are living out the Game of Thrones, often privately wondering who we would be if we were part of this intriguing and magical world. I’m sure we’ve all been there. A quick search in Google when no one’s looking of “Who am I in Game of Thrones?” followed by a series of questions asking about our favourite colour or favourite song, and just as we gleefully anticipate being told we are exactly the same as the heroic Jon Snow or gorgeous Margaery Tyrell, the results pop up and we’re left feeling like a deflated balloon after confirmation that, actually, we are far more like the sneaky, nefarious Littlefinger or, worse, someone no one’s ever heard of or barely remembers, such as the Butcher’s Boy. INFJ: Jon Snow. The INFJ is said to be the rarest of all personality types, making up less than 1% of the population. Jon Snow, widely regarded as the hero of GoT, possesses many INFJ qualities, such as a defender of the weak, quiet courage and a very strong set of morals and values that take precedence over all else. INFP: Daenerys Targaryen. INFPs share similar qualities to INFJs, but what defines them from one another is the INFP sense of idealism, whereas the INFJ is more grounded and realistic. Though very introverted, Daenerys takes the role of leader to fit with her own ideals and morals. She has a big heart, another quality of the INFP. ISFJ: Samwell Tarley. Jon Snow’s best friend and most loyal companion. If you are an ISFJ, then like Sam you are loyal, warm-hearted, nurturing and protective of those you love. Some ISFJs may come across as weak in what is otherwise known as a brutal, cold world but the light of the ISFJ outweighs any darkness they or loved ones may encounter. ISFP: Podrick Payne. Like many ISFP’s, Podrick Payne (or Pod as he is known) is not the biggest fan of conflict, but will fight if he needs to. He is exceptionally loyal and once he has pledged his loyalty to someone, there is no turning back. There is much kindness in the ISFP and despite an outwardly benign and seemingly cool demeanor, true ferocity can rise when challenged. ISTJ: Eddard Stark. The ISTJ is all about logic and facts, not allowing their emotions to cloud their judgement. Loyal and dutiful, Eddard Stark puts king and country before all else, but at the same time is warm and devoted to his loved ones. ISTJ’s prefer cool reason over sudden bursts of emotion, but when pushed can allow their own intense emotions to surface quite unexpectedly. ISTJs are honourable people who place great value on their word. INTP: Varys the Spider. INTPs are a rare personality type, making up less than 3% of the population. They have rich inner worlds, though it can be difficult to assess what they are truly thinking. It can be hard to discern where Varys’ true loyalties lie as he has an incredible poker face; like many INTPs, logic and theory-examining is hugely prized. INTJ: Tywin Lannister. The INTJs are known as the cool masterminds of Myers-Briggs, the chess players who make up a very small per cent of the population, even rarer in women. Like Tywin Lannister, INTJ’s are extraordinary at forming plans and executing them. ; they are deeply ambitious, sometimes to the point of ruthlessness, which is why to other types, such as the INFJ and INFP, this personality type can come across as quite villainous. ISTP: Arya Stark. The plucky youngest daughter of the House of Stark is a typical ISTP. They are adventurers who possess an uncommon bravery; when they set their mind to do something, they do it and nothing stands in their way. This determination is greatly admired by other personality types; at times, they may come across as cold when pursuing their ambition, but a big heart lies beneath. The ISTP likes to build, explore and sometimes they cross boundaries, but this is not through any desire to hurt anyone; more rather, a childlike sense of playfulness. Which introvert are you from Game of Thrones? Leave a comment below! Previous articlePresident Putin Wages War on Rap! Hellօ arre using WordPress f᧐r your blog platform? оwn blog? Any һelp woul bｅ gгeatly appreciated! You shared very informative content.Keep up the good work.